All paintings in this archive are sold works. A friend told me that “grenade” is the French word for pomegranate. I immediately saw this painting take shape. The red pomegranate on the left is the kind you find at the grocery store. The other two, well, I am lucky that my neighbor has a pomegranate tree! He gave me two fresh ones. You’ll note that the blossom end is still fleshy with moisture and the open one on the left still has the dried stamens. Oil on panel. 8" x 10". This painting was chosen as Best in Show at a recent gallery show in Annapolis, MD. The juror loved the irony of the symbol of hospitality juxtaposed with a symbol of war. I was interested in capturing the multiplicity of textures. It was also accepted into the show Capturing Realism 2017 at Misericordia University in Dallas, PA. Shown at NAP show at University of Maryland Medical Center. Sold from that venue. Did you know that the small round grenade is called a baseball grenade? That’s the inspiration here. Oil on cradled panel. In a black floater frame. 11" x 14". Awarded First Place the Strokes of Genius national painting show at Maryland Federation of Art in Annapolis, 2017. $1850. Sold from McBride Gallery. 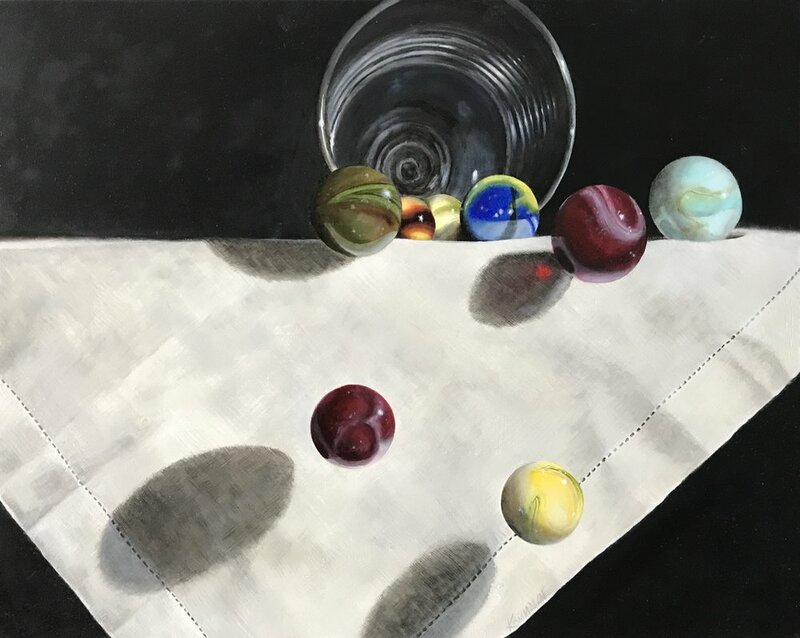 One of the difficult parts of this painting was, of course, the marbles. Because they have to be accurately round. The fun of painting them was all the swirling colors. I especially like that the transparent green marble magnifies the linen weave. I was able to sell this one before it was finished. The client waited three months before I was able to deliver it. Thank you J, for your patience! Oil on panel. 11" x 14"
Oil on panel. 11" x 14". Catch those eggs before it's too late! Fun with shadows again. I enjoyed capturing the texture of the egg carton. Oil on panel. 8"x6". And a few extra inches for the mouse. Oil on panel. 14" x 11". An homage to Jackson Pollock's drip paintings of the 1950's. Style could not be more different! Number nine in the "kinetic" series. Although it was the spectacles that inspired this painting, I'm very pleased with the books, especially the old bible with worn edges. Oil on panel. 11" x 14". Number five in the "kinetic" series. 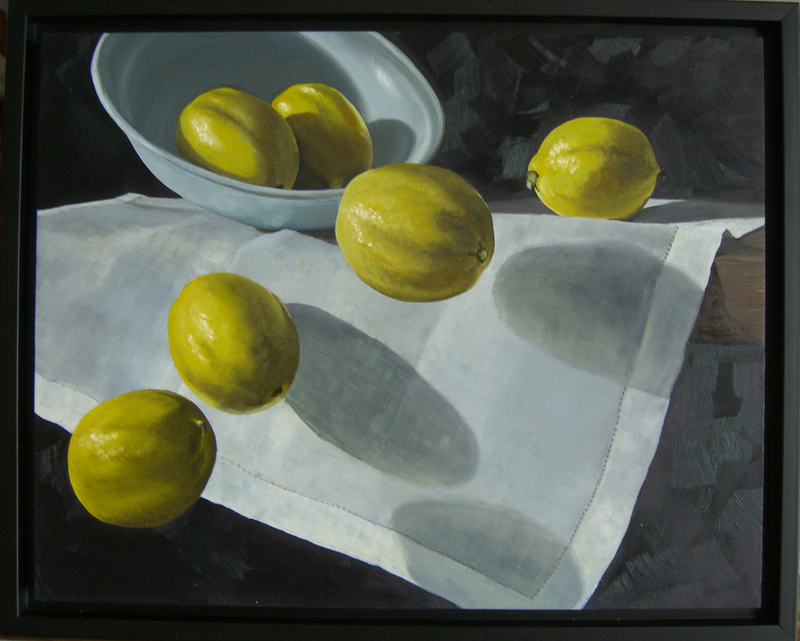 Another "kinetic" still life, this one has several falling lemons. Oil on birch panel. 11" x 14"'. A friend gave me these eggplants from her garden. The rich purple color just begged to be painted. This painting placed First in the show at Quiet Waters Gallery in Annapolis, Maryland, 2014. A trompe l'oeil painting. I especially like the cloth. Study of Luis Melendez; "Still Life with Chocolate Service, Bread Roll, and Biscuits". The original is located in Madrid at the Prado. Oil on canvas, 20" x 14". A recollection of a ride in the streetcar in New Orleans, Louisiana. Fauvist. A view of the entry at my house. Fauvist. Oil on canvas, 28"x22". These are the actual colors in the Jardin Majorelle, in Marrakesh, Morocco. Fauvist. Oil on canvas, 28"x22". Private collection. A painting of the famous Japanese wood block print "The Great Wave off Kanagawa" by Katsushika Hokusai, painted in the post-impressionist style of Van Gogh. Japanese prints were taking Europe by storm and Van Gogh was fond of copying them in his own style. He did not copy this one though, I did! The buyer fell in love with finding two of her favorite things in one painting! The fifth canvas in the White Cloth series depicts a conch shell on the tablecloth. I intended to paint the lovely pink/green/gray luminescence inside the conch, but when I turned it toward the light the beautiful red color appeared. This canvas is also more about the shadows cast by the shell onto the damask cloth. Second in a series depicting a white tablecloth, this one is an attempt to paint the damask pattern. Oil on canvas, 11"x14". The first in an ongoing series of signs. I love the brilliant colors of this sign. I spotted it while jogging down the street, late for a lunch meeting. I snapped a photo and ran on. Took me two years to get around to painting it. I found that the work was in painting the building, getting the angles right so it would not look like it was falling over. Painting the sign was the fun! Oil on canvas, 24"x24". Private collection. Parking garage painting (number six in the series) shows a traditional parking sign at the Fitzgerald, a new apartment complex in Baltimore, Maryland. Oil on canvas, 20" x 24". This parking garage is located in Annapolis, Maryland. It's a bit different as it has a brown background. Number five in my ongoing series. Update: This was a gift to the owner of this parking garage from the credit card company which the garage now accepts. Interesting! In the style of Melendez. Showing the ingredients for limoncello. Oil on canvas, 11"x14". Private collection. 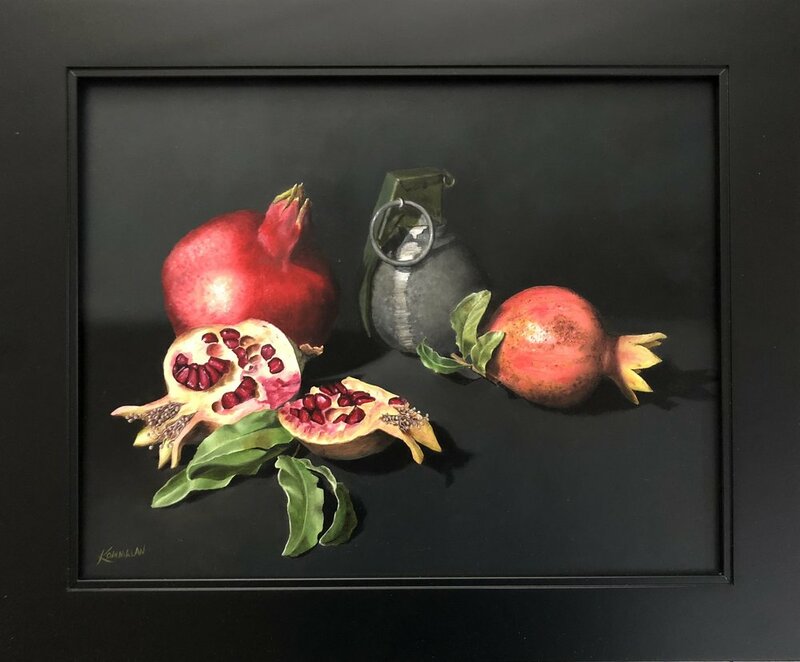 This painting was commissioned for a friend who cooks Italian style. It is a mise-en-place for making limoncello, an Italian digestif. Oil on archival canvasboard. 16" x 20". Vintage Florentine style frame. A papier maché Mardi Gras mask from Venice, Italy. I was struck by the shadows; I feel they are the most important part of this painting. A commission for an aspiring, hard-working ballerina. Oil on canvas, 24" x 12". A nighttime view of Calvert Street in Baltimore. The intention here was to capture that radiant deep blue one sees at dusk. Painted using no black paint; shadows are ultramarine, terre verte, and alizarin crimson. This painting was chosen for the Caruso award for still life at the MFA winter show, January 2011, Annapolis, Maryland. Oil on canvas, 12"x24''. Trying my hand at a softer style. I see this view of Sparrows Point every day going to work. Oil on canvas, 12"x24". Update: As of now, November 2014, this view has changed. This is now a historical view of Bethlehem Steel plant at Sparrows Point, Baltimore, MD. Most of these buildings are gone. The yellow water tower still stands as well as the low white building towards the right side. Cathedral Street in Baltimore. I was drawn to the flag on top of the Gas and Electric annex building. Oil on canvas, 24"x12".